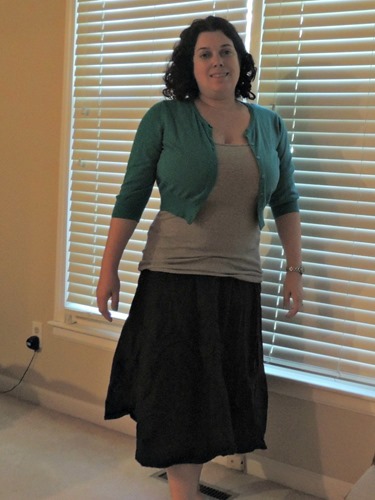 This month I decided to take part in the Skirtember challenge. The challenge is officially to wear a skirt every day in September, but you can also do so for as many days as you choose. 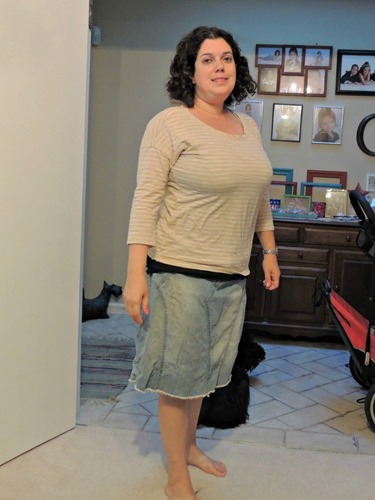 I decided I would wear a skirt (or a dress) at least three days a week in September – knowing that the challenge would be easy at least 3 weeks out of the month due to the Jewish holidays! One of the harder parts of the challenge for me is taking photos of my outfits – as you can see below. I mostly took these photos on my own using the self-timer on my camera (the only one I didn’t take is the first one). 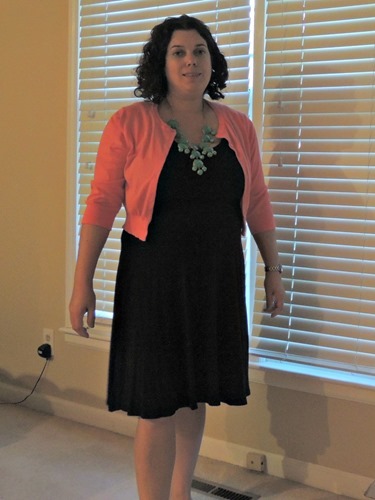 I also planned my outfits and took the photos ahead of time for the outfits I wore on Rosh Hashanah. September 2. Pretty bad photo of me! I wore a dress under a shirt. September 3. I’ve had this skirt forever, a friend of mine gave it to me. It has pockets, which I appreciate for holding my phone! And Kristin told me denim skirts are in. The top is Old Navy and I love it. September 5. I really like this outfit. The dress fits me well. 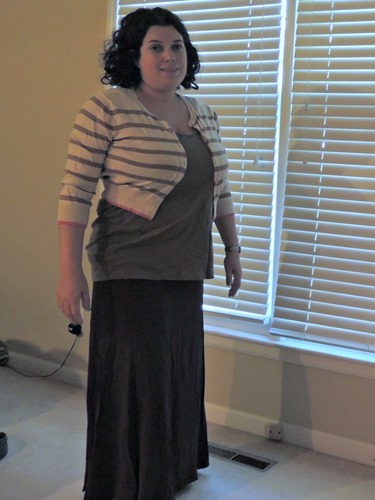 I also love these cropped cardigans from Old Navy as you will see in the next two photos! And the necklace obviously makes the outfit. September 6. I found this maxi skirt in my closet. I don’t think this outfit was really fancy enough for Rosh Hashanah though! September 7. 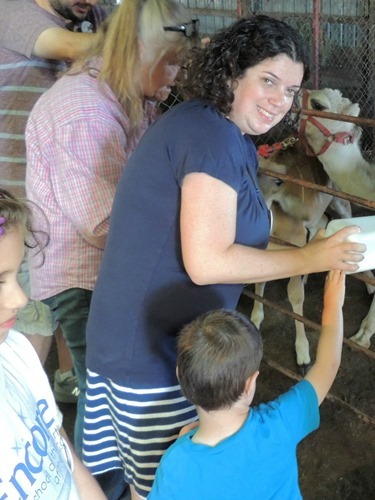 I actually wore a black and white tank instead of the grey and wore the same necklace as in the Sept. 5th photo. Just for fun. 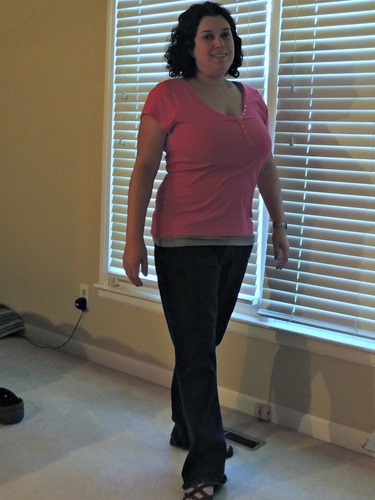 I wore this on September 4 and see those jeans? I found them at Goodwill for $3. They are Old Navy jeans. Love it. I’m enjoying styling different outfits and have been thinking about how I will bring my summer clothes into the fall season. Hopefully I’ll be posting more on that later this week!